So last week while shopping at Michaels (my local craft store), you can imagine my surprise when this little booklet caught my eye at the check-out counter. 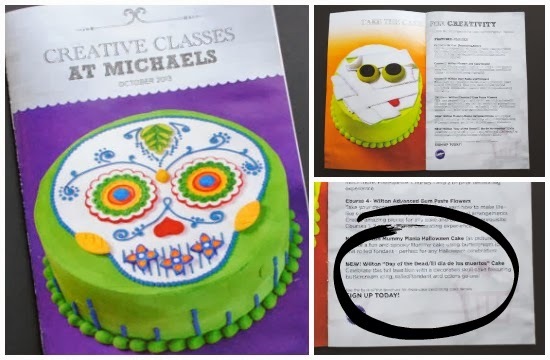 A new class from Michaels and their Wilton cake decorating series on how to make your own Día de los Muertos cake! I don't know if this is available in all of their stores, but it just goes to show how significant the holiday has become here in the States if they've added it to their class line-up! Do you have a Michaels near you? Wouldn't this be a fun class for you or your older kids to take?